Top Illinois Artist Preston Jackson Urges Peers: "Get Some Guts"
Preston Jackson at his Peoria studio next to a painting depicting a scene from his childhood in Decatur. Preston Jackson is a martial artist, an accomplished guitar player, an educator and professor-emeritus, and a visual artist who has studios in Bartonville, Peoria and Chicago. 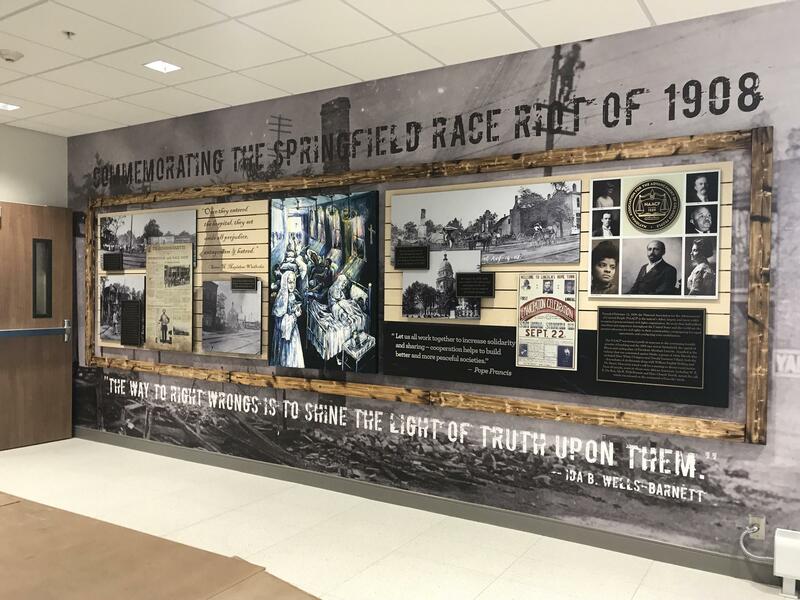 His newest work, unveiled on Tuesday, is a mural that depicts the Hospital Sisters of St. Francis caring for the wounded after the 1908 Race Riot in Springfield. About ten years ago, Jackson also did a sculpture commissioned by the NAACP that is shaped like two chimneys, reminiscent of remains from the homes in black neighborhoods that were burnt down by whites in the riots. That sculpture is across from the Abraham Lincoln Presidential Library and Museum in Springfield. The NAACP was founded in part as a response to the riots and lynchings — Jackson calls it a massacre — that happened in Springfield. Listen to the interview with Preston Jackson about his artwork and life. He says he considers his role as an artist to be giving voice to people who often go uncovered in the history books. Much of his Peoria studio is taken up by 3D models of homes, businesses and people in Chicago's Bronzeville during the Chicago Black Renaissance. He's open and expressive about politics, using his platform to highlight what he sees as racist and xenophobic policies and rhetoric put forth by the current presidential administration. Much of Jackson's work involves the political implications of the past and present, and also the future — especially in terms of climate change. "If you don't speak up, no one is going to get into a better position," Jackson says. "So artists, get some guts." Jackson says while he began his professional career with abstract artwork, he was deliberate in making the change to representational work; his aim is to "make it plain." "I want to offer art to people of all levels of education," says Jackson. Jackson is well known in the art world, and was recently put on a list of 10 best-ever Illinois artists. But the breadth of his work and talents is hard to collect comprehensively as his output is proflic and diverse. He's a bit enigmatic by design. As for his age, he'll concede he grew up in the 1940s in Decatur in a large family. He offers no specific birth year. His father was a foundry man and preacher, and his mother a housekeeper. His dyslexia was a challenge from a young age, one he met by drawing. He says for instance he would imagine the word "look" as a pair of glasses. Jackson is professor-emeritus of the School of the Art Institute of Chicago. He has touched many lives as a teacher, having overseen art classes for kids and served as a mentor for many young people. Jackson says he started learning martial arts in 1968 as a means of self defense. He says he attended multiple rallies where Stokely Carmichael of the Black Panther Party spoke, and was on the streets with anti-war protestors at the 1968 Democratic National Convention in Chicago when riots broke out. He says he can still remember the sound of "knee-caps hitting the ground." Today, he still regularly does tai chi as a means of spiritual practice and social interaction. Other than his family — a wife and two daughters who are also in the art field — Jackson says his foremost priority has always been artwork. Through his sculpting, he has preserved the likes of Barack Obama, Richard Pryor, Martin Luther King Jr., plus countless representations of everyday people. As for his own legacy, he says he hopes his artwork continues to connect with those from all walks of life in a visceral way. "I want them to feel it, not just see it, but to feel the subject right away and connect to it." Through his public art displays, like the newly installed exhibit in a Springfield hospital, those connections will continue for generations to come. Kathryn Harris remembers coming across a manila folder, tucked away in a filing cabinet. It was the seventies, and she was working at Springfield’s public Lincoln Library at the time. The newspaper clippings inside told a story of a city in flames, of lynchings and death — something she hadn’t remembered hearing before.